We all know just how beneficial aero bars can be for a triathlon, but if you’re not using them to their full potential then they’re really just taking up a lot of wasted space on your bike. There’s no denying they can improve your speed and lower wind resistance but if you’re not educated on how to use them, install them, and adjust them then you’ll simply be making them worthless. We’ve compiled this simple guide to show you the best way to install your aero bars so that they give you the best results and how you can adjust them as you need. Once you know how to achieve the optimal aero position on your bike with the bars you’ll be well on your way to success with your next triathlon. Aero bars are an extra handlebar that attaches to your regular handlebar and they’re ideal for triathletes who don’t want or need to purchase an expensive bike just to get better aerodynamics. Just because they improve your racing skills, though, it doesn’t mean they always have to be in use and you’ll find there are some times more than others when they can be beneficial. The best place to use your aero bars is when you’re riding on a flat surface or going on a descent as this is when the wind can really work for you due to the high speeds you’ll reach. When you get yourself to the ideal cadence you can remove your hands from the handlebars and move them up, placing your elbows on the aero bar pads and grab hold of the bar in front. Try to avoid using your aero bars through all portions of the race, especially when you’re going uphill. You’ll usually need to be in a more upright position for this and at a lower speed so that you don’t use all of your energy up, so don’t rely on your aero bars here. Stay in control of your bike in the regular position during these times so that you can keep a low pace as you need it. When you’re first installing aero bars there are a couple of different methods you might like to try. Some people buy clip-on bars that make it easy to install themselves at home, whereas others will only rely on a professional at the bike shop to put theirs in place. There’s no right or wrong approach, but if you feel apprehensive or have a big event coming up you might want to put your trust in the professionals. If you need to tighten or loosen the bars, you can do so with an Allen wrench usually, but you want to keep them at a tilt which makes your arms parallel to the ground. Use this as your guide and adjust as you need to, with some cyclists going as far as taking a wrench along with them on training rides. The clip-on style of aero bars are easier to use but some don’t come connected to the bike which means you’ll have to move your hands separately in order to break. If you do adjust or install those connected to your bike you have to rewire them so that they reconnect, and always do a check before you begin a big event. There’s no point having aero bars fitted if you don’t know the right position to make them work, and there are two main angles that you need to try and achieve. Firstly, you want your arms and legs to be at a 90-degree angle away from each other. As you tilt down to use your aero bars it should form a second 90-degree angle which lowers your torso down towards the ground. The purpose of this position is to reduce wind resistance, which is why the best time to use the aero position is on flat surfaces or when going downhill. As your torso is low it will be better at resisting the wind and it will allow for the best transfer of energy to the pedals, which means less effort from you for more results. Again, if you have an accredited bike expert helping to install your aero bars they can show you how to get the best position. 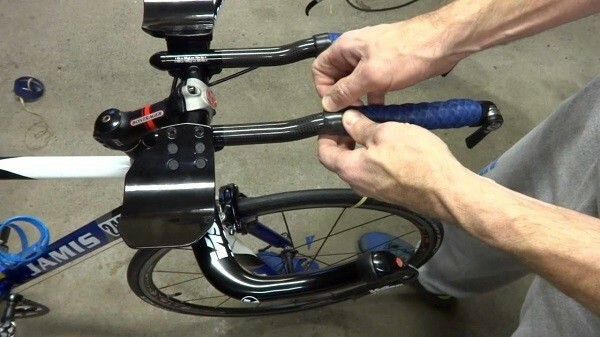 They made adjust it as you sit on the bike to ensure it’s exact, and this is usually recommended if you’re getting ready to compete in a triathlon. Some might even find that after some use their bars begin to come loose, and in this case, an expert can show you the correct installation to prevent it from happening in the future. There are plenty of reasons why aero bars enjoy the popularity that they do, with so many benefits to the cyclists from fatigue reduction to faster speeds. When you can afford or justify the cost of a brand new triathlon bike then the simple addition of aero bars to your bike can do just as good of a job in improving your aerodynamics. Triathletes take these events very seriously and that’s why it’s usually recommended to have your aero bars installed by a professional. You spend so much of your time and effort in training for these events so speaking with an expert and having them adjust the bars to give you the best riding position shouldn’t even be given a second thought.